A Day on Onaman Lake…..
We had three goals for this past week. Goal number one was to get out to our favorite lake and film one of our fishing sessions. The weather did not look too promising on the day we chose to do it but we went anyways and were going to make the best of it. Onaman Lake is a very big but remote lake in the area. In fact there are only two ways to get there; fly in or walk a mile and a ¼ to several boats Pasha Lake Cabins has on the lake. The walk in was not too bad, we wore our bug suits to keep the mosquitoes off of us. Since we are carrying in all our fishing gear you usually don’t have a free hand to do any swatting. Our second goal for the week was to catch a few northern pike on our flyrods. During our Alaska trip last year we got to experience what it was like catching big fish on a flyrod. Since there are no salmon in this area we thought northerns would be the next best thing. We partially accomplished this goal, we got out fishing as planned but did not catch any fish on the flyrods. The wind just did not cooperate making it nearly impossible to throw a fly. And our last goal was to finish cutting my way into the bear stands on the overgrown logging road that I started a couple weeks ago. Although the road carries on for quite a while longer I was able to cut my way into three of the better bear stands on this road and put some cameras up to see what kind of bears are in the area. Stay tuned for some pictures if we get them! We are actually taking a mini-vacation and are currently in Wisconsin. Saturday we are headed to South Dakota for a week to do some work on our property. We decided to leave the rig in Canada, drive the truck down and rent one of the cabins at Country Charm just down the road from our property. Hopefully the weather cooperates and we get a lot of work done! Our second week in the Ontario bush consisted of more fishing, relaxing/reading and scouting for bears stands. The mosquitoes don’t seem to be as bad. Either that or we are getting used to them. Now that I think of it we are just getting used to them because as I write this there are as many staring at me on the screen next to me as there was last week. We are starting to get settled in and into a routine. As much as we like fishing if we get out 2-3 times a week that is plenty for us. Fishing at Pasha Lake Cabins is not like fishing at other resorts. This is more of an adventure resort where you travel to different remote lakes. Pasha Lake itself has some northern pike and lake trout in it but we rarely fish it. Instead we opt for one of the 30 or so remote lakes in the area to try. This week we tried a lake we have never fished before. As a matter of fact this lake probably sees less that 3-4 boats a year. There are several challenges related to fishing new lakes. The first is getting there. These lakes are not well mapped nor are they on blacktop roads. If you are the first one in there for the year you will often have to cut your way in as trees fall across the logging roads each winter. We found the road in without a problem and there was only one tree over the road which we were able to drag out of the way with a strap hooked to the front end of the jeep. Once we got to the lake the landing was pretty wet but we figured we could make it without a problem. Well, we figured wrong. After we got the boat launched and started up the bank the jeep immediately sunk in the mud. There we sat with all 4 tires just a spinning 3 kilometers and millions of mosquitoes away from the main road. For 45 minutes we tried pushing in both directions, we tried laying a bed of rocks under each of the tires, we tried logs, sticks and branches under each of the tires, and nothing worked. Finally as a last resort I just went ape crazy on it and started putting it in forward and reverse as fast as I could rocking the bejesus out of it and after a few minutes it finally popped out of its holes…right down into the lake! Well we were out of the holes but on the wrong side of the mud hole. But I just gave it the gas and bounced over those holes as fast as I could and was up on dry land in no time. We did really well on another fishing trip this week but only took one picture of this 23” blue walleye. It is really unknown why these fish are blue. The experts don’t know if it is a phase the fish go through, something to do with the mineral content in the lake or if the fish are born blue and stay that way all their lives. During our bear scouting adventures we saw several forms of wildlife, (no bears yet…). First up was an attack grouse. We have run into these aggressive creatures in the past and find them quite entertaining. When you run across a mama grouse with babies they will often fluff up their feathers, open their wings and charge you to distract you while the babies run for cover. You have to be careful you might get an ankle pecked! Attack of the killer grouse. Hard to take a picture when you are retreating! Babies escaped but she is still keeping an eye on me! We also saw a young bull moose wandering down the road. This time of year last year’s babies are kicked out of their home area by their mothers so she can focus on her new baby. As a result you will often see yearly moose wandering looking for a new home territory. Well that’s it from week 2 here at Pasha Lake, tomorrow we get to go to our favorite fishing lake. I am charging up our video cameras in the hopes of getting some good footage to make a movie. If that does not work out perhaps I will spend some time looking up some of these mysterious websites from the anonymous comments! Few places rival the fishing opportunities like the Nipigon area of Ontario. We have been coming up to Pasha Lake Cabins every year since 2006. When we were working we would spend virtually all our vacation time up here. Since hitting the road we have spent every summer and part of the falls there…… That is until last year when we went to Alaska. Even when we were having a trip of a life time traveling the backroads of British Columbia, the Yukon and Alaska we were still talking about how much we missed our friends Chad and Michelle and the fishing in this area. Oh, how we wish could somehow clone ourselves and be in two places at once! So it was with high anticipation that we left the Barnesville area and started heading northeast. But first we stopped for a couple days at friends and former co-workers of mine Joe and Ruth at their cabin just outside of Dent, Minnesota. Joe set us up in his neighbor’s driveway as they were spending the summer in….. you guessed it Alaska. It was a perfect spot to moochdock for a few days as we visited Joe and Ruth. They treated us like royalty feeding us at every meal and catering to anything we wanted to do. So what did we do you ask? Well, keeping in theme with our previous post we carried on with seeing a couple of the tourist attractions this area had to offer. Did you know that Frazee Minnesota has the world’s biggest turkey? Well they do! Not only do they have one, they have several scattered throughout the town. Unlike Dino’s claim about the Rothsay Prairie Chicken in his most recent post, I don’t think these are actually life sized replicas of an ancient subspecies of today’s smaller turkey. We also stopped by Pelican Rapids to get a picture of their giant pelican! As a primer to our upcoming Ontario adventure they took us out fishing a couple times. We caught tons of fish including largemouth bass, northern, crappies, sunfish, rock bass and walleyes. Probably the most species we have caught in one outing. They were in the process of staining their cabin so I offered to help them stain one afternoon in an effort repay them for their generosity. We only did about a 20’ section on one side and it was a great reminder of some of the things we are missing not owning a house and also a reminder to go as maintenance free as possible on our next house! After 3 nights with them it was time to move on and head to Ontario. The first day we drove 8 hours and spent the night in Grand Portage, MN in the parking lot of the casino. The next morning it was just a short 6 mile drive to the border. I don’t care how many times you cross the border, there is a certain amount of anxiety that comes with each border crossing. We make sure we have all our paperwork ready (passports, ATV registration and dogs papers) and within reach when we hit the border and we also go through our mental checklist of the questions we think we will be asked so we have the answers ready. We also have a routine that we found successful and when something works we stick with it. Before approaching the check station we remove any hats and sunglasses, we roll down the driver’s side front and back windows and turn off the vehicle when we approach the check station (hanging onto Daisy!) and hand them our passports. · How long are you staying? · Are you bringing anything you will leave in Canada? · Do you have any firearms, weapons or pepper spray? · Do you have any alcohol or tobacco products? · When was the last time you were in Canada? Sometimes they ask more questions but you are almost guaranteed to be asked those. If all goes well you can be on your way in a minute or two at the most. Barb went first and it took an unusually long time so I thought for sure she was going to be pulled over and searched. But after a few minutes I heard the truck start up and she pulled the rig onto the main road and was on her way. Then it was my turn. He said “So you’re the other half?” He asked me the alcohol and firearms question and sent me on my way. Later I asked Barb what took her so long and she said he was just chatty. Talking about the bugs, the weather, the dogs, her work and where she has been. I don’t want to curse our luck but after dozens of border crossings with the rig we have yet to be stopped and searched. Not that we would try to do anything illegal, it is just not worth jeopardizing us coming up here for something stupid like that. From there it was on to Thunder Bay and through Nipigon. 3 ½ hours later we were pulling into the resort. Our welcoming committee consisted of nobody, nobody at all. It seems all the fishermen were out on the lakes, Michelle was at church and Chad was out on the lakes himself. They finally arrived home a few hours later and we spent some time getting caught up. The next few days were spent setting up our home for the next few months. The most important aspect of this is trying to get the rig as bug proof as possible. This consists of putting up our screen house and using blue painters tape on the rubber around the slides. In years past we have found these two things keep the majority of the mosquitoes out. Even with these precautions they still get in by the dozens each day. Our inside arsenal consists of one thing. The tennis racket bug zapper. It is never out of reach when we are sitting inside the rig as sooner or later one will try to attack you. When we go to bed we close the bedroom door to minimize the areas they can launch their attacks. We then go around the room with the tennis racket zapping any mosquitoes that make themselves visible. The other day after a rainy day we were in the bedroom reading before we turned out the lights and wave after wave of mosquitoes continued to assault us. We have no idea how they were getting in or where they were hiding. It was like they were forming squadrons and coordinating their attacks! I was zapping them with forehand volleys with the racket, backhands and a few moves that don’t even have names. The air smelled like burnt mosquito wings and the bed was littered with carcasses of the fallen soldiers. But their comrades continued their assault. During one particular assault there were three buzzing around my head. As I was concentrating on one, another one decided to make a kamikaze move and dove right up my nose! Which will explain the tennis racket impression on the tip of my nose tip of my nose. We eventually won the battle and slept somewhat peacefully. Even with all this I would only rate the mosquito level at about a 6 or 7 out of 10 we have definitely seen it worse. So why would we subject ourselves to such torture? Well besides spending the summer with our friends we come for the fishing and hunting. The fishing up here is the best we have ever encountered and over the summer I hope to write about many fishing adventures. So far we have only gotten out once to one of our favorite lakes. I can’t explain how good it was to launch the boat and motor across the lake, it was like visiting an old friend. And that friend was good to us! We had great fishing catching perch, walleyes and northern pike. There is nothing like the feeling of having your rod bend and finessing a big walleye to the surface. Barb was all smiles headed out on the lake! I know not everyone is real big on hunting but it really helps support many families in the area. The main industries up here are logging, hunting and fishing. Without them it would be difficult if not impossible for the locals to make a living up here. Speaking of hunting, although the bear season does not open until mid-August I have already started to get some of the stands set. We have a VIP bear hunter coming up this year and I want to make sure he has an experience of a lifetime so I have been clearing out a logging road that has not been accessed in years. It is seriously grown over and has lots of downfalls but the hunting should be good back there! I still have some work to do to clear this road! Yup, it is good to be back here….. we will be posting more fishing tales in the following weeks along with our other adventures from the Ontario bush! Bucket List Items Crossed off in Minnesota! Our main reason for visiting this area was catching up with good friends Dino and Lisa. We had last seen them last September when we stopped by Yellowstone National Park where they were working. Since then they have eluded us.....we searched high and low on our travels, Arizona.....no Dino and Lisa.... Utah, Wyoming, South Dakota, North Dakota even Wisconsin...if they were there we could not find them. That is until we vaguely recalled that they were going to be visiting family in the Barnsville Minnesota area in early June. We thought if were we lucky, if we were very quiet and stealth like, that we might sneak up on them before they could pack up and vacate to another "undisclosed location" before they knew we were in the area. There is only one campground in the Barnsville area, Wagner City Park, so we thought our chances were good. We left Douglas, North Dakota with high hopes of catching up to this elusive couple. 6 hours later as we slowly pulled into the park; we spied their rig with them sitting outside enjoying a cocktail. We saw the look of panic on their faces when they spotted us but by then it was too late, we had them in our crosshairs! They were good sports and acted like they were happy to see us and even made us dinner that night but deep down we knew they were already planning a late night escape. We were surprised each morning when we woke up and looked out the window to see their rig still there. Having lived in this area much of their lives they are very familiar with this area and showed us many of the sights. Now we don't have a bucket list per se but if we did many of the sights we saw would have been on it! Ya, that's me on Otto's back! But the highlight of our visit was when Lisa showed us her childhood home in the center of Fergus Falls. Originally known as: "Minnesota’s Third Hospital for the Insane" the Fergus Falls State Hospital broke ground in 1888 and closed its doors for the last time in 2008. Lisa pointed to the window which was once her room and regaled with tales of what it was like to live there. (You think I am making this up? The fact that she married Dino should be proof enough!) At its peak the "hospital" housed 2,000 patients and served pie each week. This is an amazing complex that stretches a full 1/3 mile, it is now vacant and reported to be haunted by some of its former tenants. Lisa's room was in the right wing, second floor, third window from the end. We also visited Phelp's Mill an old flour mill from the late 1800's. Producing 60-75 barrels of flour a day this mill operated from 1889 to 1939. It was interesting to walk the mill and see how they produced flour back in the day. But wait there's more! How many of you have seen the ORIGINAL woodchipper from the movie Fargo? I tried to get Barb to posed like I was stuffing her in it but she wanted nothing to do with that. For those of you passing through Fargo, stop at the Visitors Center and you can cross the woodchipper off your bucket list as well! Also pick up a visitors guide. The last two pages are filled with coupons, there are 2 for 1 coupons for several of the local breweries so that is where we were off to next....The first stop was at the Fargo Brewing Company Ale House followed by JL Beers where we have a couple more brews and a great burger. 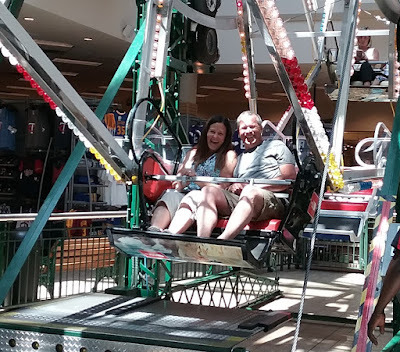 Barb and Lisa noticed that there was a coupon for a free Ferris wheel ride at the local Scheel's Sporting Goods store so off we went. Into the store we went coupons in hand, turned them into the cashier for tokens and went and stood in line for the Ferris wheel. It was then we noticed that everyone standing around us was about 3 feet shorter and 40 years younger than us. Just when you thought it could not get any more embarrassing we see Dino elbowing and pushing little kids out of the way so he could get to the front of the line. Right before getting on Dino made the comment that he hoped he did not run into anyone he knew. The ride was about 10 minutes and we got off before Dino and Lisa. As we were waiting for their cart to come around we noticed Dino waving at someone. When they got off they said they saw their son Roman and fiancée Heather on the second floor. We went over and met Roman who I think was mortified that his mom and dad we on the kiddie ride at the sporting goods store! Hopefully we will be posing with a few of these up in Ontario soon! One of the things we really found interesting about this area was the communities approach to the area. The campground was on the honor system, there are literally no rules, no signs saying don't do this or don't do that. Everywhere we went there is no litter, no graffiti and everything was open. Phelps Mill was completely open with no one around to supervise, the picnic tables in the park had power outlets and the restrooms were clean and had bottles of hand sanitizer on the sink counter. There were no signs telling you not to climb on Otto and it looked like it was actually encouraged. It brought us back to the way life should be lived. Respect the resources and use common sense. As you may recall, I broke one record last week. Well evidently Barb broke a record this week as well. We did not know there was even record keeping in this category but evidently Barb ran across one of the few official record keepers. She had went to Fargo with Lisa to do some shopping and when she came out of the store and approached our truck she found this certificate of achievement.......Another bucket list item cross off! To be fair it is often a challenge to park our truck into just one spot so leaking into a second spot is not uncommon. She is quite proud of this record but is confident that with hard work and practice that she could break it again. We had another bizarre incident as we crossed the border from North Dakota into Minnesota on another shopping trip. As I was driving in the right lane I noticed a MN State Trooper on the shoulder so I moved into the left lane as I passed. The trooper immediately turned on his lights and pulled in behind us and pulled us over. I knew I was not speeding and all 4 of us were wearing our seatbelts so we had no idea why I was pulled over. The trooper approaches the passenger side window and I thought to myself. "Good, he is after Dino, must think he is a terrorist or something". But when Dino rolls down the window the trooper asks me for MY drivers license! He then goes on to say that the reason he pulled me over was that all vehicles over 10,000#'s must stop at truck stops in Minnesota. What?!?!? The trooper went back to his squad car returning a short time later with a warning ticket. I asked him a few questions...... Although generally for commercial vehicles, private vehicles over 10,000# (26,000 in ND and 8,000 in SD)must stop at weigh stations so they can make sure you are a private vehicle. He went onto explain that although they don't want RV's pulling in, they are looking for RV haulers who take of their signage and try to sneak by weigh stations on their return trips when they are not hauling an RV. Bizarre. This truck was Barb's primary work and shopping vehicle and has been driving by hundreds of weigh stations while not hauling (in Minnesota) and never been pulled over. The only thing I can think of is that when we passed him and he saw that we did not have MN or ND plates he thought maybe we were haulers. Daisy even got a spa day! Today we lift the jacks for an hour drive to another friends house for a few days and maybe get a pole in the water! For those of you who may take me a little too seriously, Lisa did not live at the hospital. She did say that she had been in it several times when her mother painted murals in some of the rooms but never actually lived there......or did she? We may never know! This past week at the farm was all about trucking wheat to the local elevator. To be specific it was Hard Red Spring Wheat. 19 trips, ~1,000,000 pounds, ~16,666 bushels…..that will make approximately 1,500,000 loaves of whole wheat bread, that's a lot of bread! They talk in terms of bushels around here “that bin will hold 22,500 bushels”, "the field yielded 60 bushels per acre". That means absolutely nothing to someone like me…what the heck is a bushel? I Googled it and found out that it takes 4 bushels to make a peck……well that didn’t help! Upon more in depth analysis I found out that wheat is about 8 gallons or 60#’s of wheat dry weight. That made a little more sense to me. The entire hauling experience is very interesting to me. First off you do not need a commercial driver’s license (CDL) to drive an agricultural semi-truck within 150 miles of the farm. Think about that next time you pass a grain truck on the road….. me loose on these country roads in an 80,000#’s missile! Actually they rode with me a few times and made sure I passed their tests before they cut me loose on my own. Not a lot different that driving our rig except for the shifting and the slowing down and stopping distances. The first step to this process is to load the wheat from one of the bins into the semi. This is done using a grain belt that has a large conveyor that dumps it into the semi hopper. I had one mishap where the conveyor stopped and dumped a bunch of grain on the ground before I got the bin closed and cleaned it up. Once loaded it is off to the elevator. To say their trucks get a workout is an understatement. I watched the truck I was operating turn over 777,777 miles on one of my trips! Once at the elevator you scan a card letting them know which farm you are. Then you pull up to the probe station where they take samples of each of your hoppers to see what you are hauling and do a series of tests to determine quality. From there it is off to the scales where you again scan your card accepting the weight. From that point you travel a short distance up to the grain dump. If the truck in front of you also dumped spring wheat you have a green light and can go right ahead and dump. If they dumped anything other than spring wheat the light is red until they are ready for you. I imagine people in the elevator running around turning big wheels to route the conveyors to the spring wheat bin but in actuality they probably just push a button. Once the light is green you can dump your load which only takes a few minutes. Once that is complete you go to yet another scale where you are weighed empty and again scan your card to accept your dry weight. Then it is back to the farm to load up again! A round trip takes about an hour and a half they typically get 4-5 trips in in a day but on two occasions I did 6 trips in a day setting a new Finken Farm record! (Now that I put that in print Chris will be on a quest to best it). They kept telling me if I was tired of trucking they could have someone else do it but I was like a kid in a toy store and did not want to stop! Since Barb returned from Pennsylvania she has been busy doing some work for her former employer which is much appreciated! We just ordered the power run to our building site in South Dakota which put a serious dent in our finances. She also mowed the lawn here at the farm which can take anywhere from 8-10 hours, that is a lot of grass! We have also been trying to get out to work Dakota every day. Barb has been doing the majority of this while I have been in the truck. We are very happy with her progress. She is now completely comfortable with the sound of a .22 going off near. She has come a long way in 6 months! We have been working on water retrieves, staying until we release her and returning to our side when retrieving. We put together this short video of her progress. We took out most of the bloopers but you can see the progress for yourself. Some of it has also rubbed off on Daisy who is turning into a little duck dog in her own right! But alas, all things must come to an end and it is time to move on from the farm. A big thank you to Bob, Deanne, Chris, Holly and Dylan for their hospitality.......see you this fall. Now we are off to northwest Minnesota to see our good friends Dino and Lisa!! !